MANILA, Philippines - Team Lea and Team Bamboo artists fought in the sixth live shows episode of ABS-CBN's top-rating and Twitter-trending singing competition 'The Voice of the Philippines' on Sunday, February 8, 2015 at the Newport Performing Arts, Theater, Resorts World Manila, Newport City, Pasay City. Miro Valera from Team Lea and Kai Honasan from Team Bamboo were eliminated in the competition as they were included in the 'bottom 2' on their respective group and were not saved by their coach. Leah Patricio and Timmy Pavino of Team Lea have received the highest percentage of votes from the public, 40.95 and 24.37 percent respectively. Meanwhile, Rence Rapanot and Rita Martinez got the highest number of votes under Kamp Kawayan, 50.78 and 18.10 percent respectively. 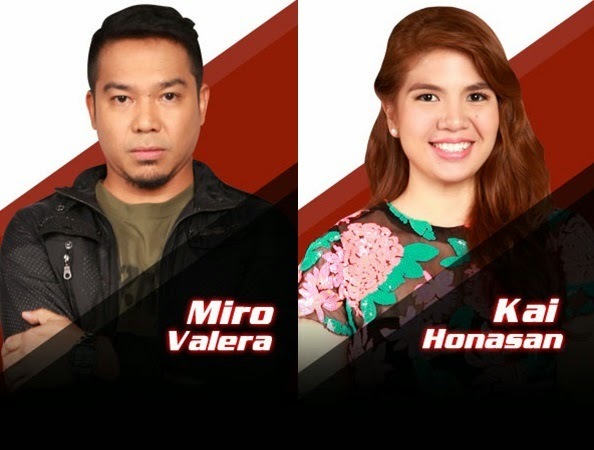 Artists from Team Lea who have clashed to win a slot in the Top 12 are Nino Alejandro ("Livin' on a Prayer"), Timmy Pavino ("My Heart Will Go On"), Miro Valera ("Kiss from a Rose") and "Kiss from a Rose" ("Healing"). Team Bamboo's top 4 who have battled for the live shows this week includes Rita Martinez ("Sweet Dreams"), Tanya Diaz ("Take Me to Church"), Kai Honasan ("Jealous") and Rence Rapanot ("Para sa Masa"). Last night, Suy Galvez from Team Apl and Jason Fernandez from Team Sarah bid goodbye to the competition. The episode of Live Shows on Sunday tops online conversations with '#VoicePH16' among the trending topics nationwide and worldwide.